How do I list my equipment? Listing your equipment is fast, easy, and FREE. Simply click on Sell at the top of any page to discover a variety of resources and videos on how to create your listing. You can use the Listing Guide to help you assemble your information and navigate the online listing process. You can also use our mobile app, which is an abbreviated version of the full online listing process created especially for use on your mobile device. For step by step instructions and FAQs, visit our app page. Prefer to email your information to us? Simply send it to listings@hddbroker.com and don't forget to refer to the Listing Guide. Listing your equipment is absolutely FREE. HDD Broker adds a small commission on top of your asking price. Our commission is the lowest in the industry, ranging from 5-12%. So when you list your equipment, ensure your "asking price" reflects what you want in your pocket! Not sure how much to ask for your equipment? Let our experts help you! Complete this online form or call us for a FREE market valuation. Do I have to sign a contract? What if I sell the equipment on my own? You have NO obligation to HDD Broker until we bring you a customer. If you sell your equipment on your own, simply let us know and we'll remove your listing. Ok, I've listed my equipment. How long until it's on your website? Each of our listings is carefully hand-reviewed. Once your listing is "live" we'll send you an email confirmation, usually within 24 hours. I have changes/more information to add to my listings, how do I do that? We love lots of information, so we've made it easy for you to send us more photos, files, and even videos! 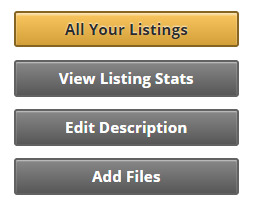 Log in to your myBroker account and click on "Your Listings". Select the relevant listing and click on "Add Files". Please contact us directly if you have a file larger than 20 MB. You can submit an unlimited number of photos, files, spreadsheets, and videos, as well as modify or edit your listing through your myBroker account (please allow up to 24 hours for the changes to go live). Where do you advertise my equipment? When you list with the world's largest utility marketplace, your equipment gets TONS of exposure. Our website is translated into 11 different languages. We have several country-specific websites, so your equipment is seen around the world in that country's local currency. Take a look at our Canadian website for example. We advertise in multiple industry publications all over the world, including Trenchless Technology, Underground Construction, and other international magazines. We pay to put your listings on other listing-service websites like Machinery Trader, Mascus, Equipment Trader, and many more. HDD Broker attends all the major industry trade shows, providing the attendees with on-site access to our listings. We've even brought customer drills to some shows! What happens when someone is interested in my equipment? When an interested buyer calls HDD Broker, we are able to answer most of their initial questions based upon the information you've already provided. We may contact you to confirm listing contents, or to ask specific questions that the buyer may have. If we receive an offer, one of our sales specialists will contact you with the details. We make it easy and painless to sell your equipment with HDD Broker. HDD Broker is a brokerage firm that acts on behalf of buyers and sellers, so we do not take ownership of equipment. However, we have a dedicated wholesale department that has a network of dealers, rental companies, and vendors that are always ready to buy. We have developed an exciting "trade-in" program, so if you are looking to liquidate your equipment at a very competitive wholesale rate, look to price your trade-in, or contact us for more information.